Technically, the term “blackleg” applies only when the infection arises from infected seed potatoes. 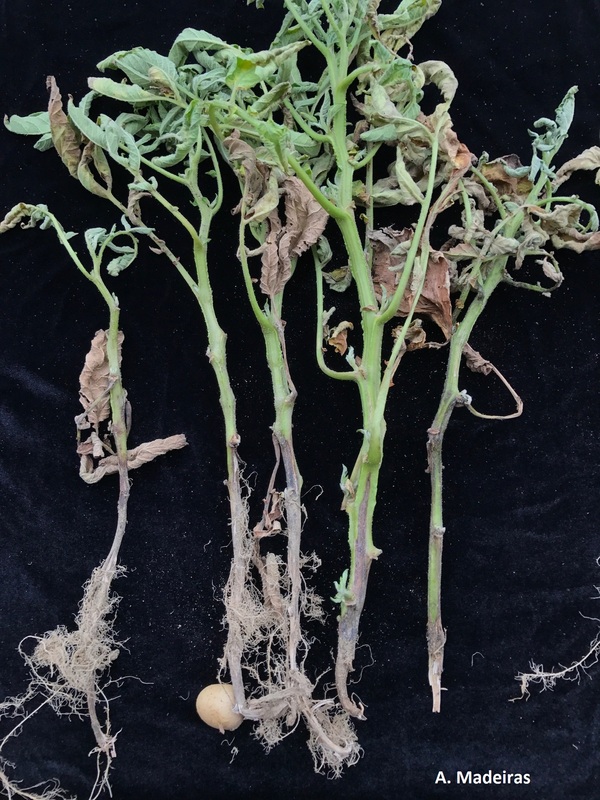 When it is not the result of infected seed, it is called aerial stem rot; however, the term blackleg is commonly used in diagnosis of both situations. This disease is caused by bacteria in the genera Pectobacterium and Dickeya (both formerly Erwinia). They also cause soft rot of tubers. Non-emergence is a common symptom of Dickeya infection the northeast. Dickeya remains latent in mother tubers early in the season while temperatures remain cool. Dickeya tends to be most virulent at higher temperatures that Pectobacterium. 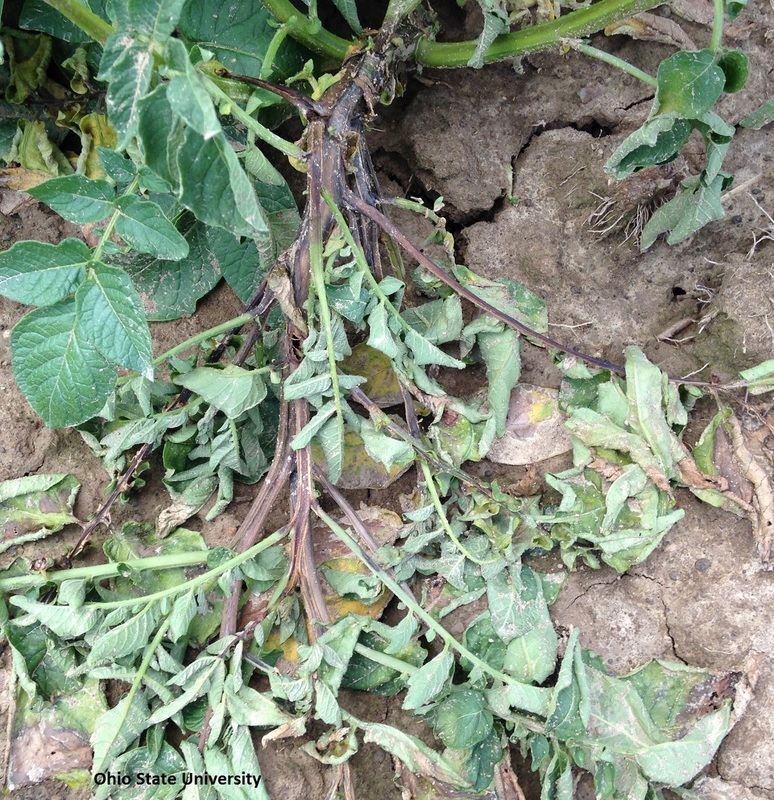 In Dickeya infected fields, disease expression begins when soil temperatures reach 86°F or greater. Corresponding air temperatures are generally ≥77°F. At lower temperatures, plants may not collapse but simply appear stunted and lacking in vigor. The optimum temperature for Pectobacterium is approximately 65-80°F. Blackleg begins as watersoaked lesions at the base of the stem. The lesions eventually coalesce and turn dark as the infection progresses up the stem. The stem pith decays and darkens, and vascular tissue in and above the lesion may be discolored. In wet weather, the decay tends to be slimy; in dry weather, stems may be hollow and desiccated, particularly if Dickeya is present. Leaves on affected stems may be wilted, chlorotic, or brown, and plants may collapse. Secondary infections may begin higher up on stems. Tubers may also rot. Dickeya causes damage at a lower inoculum level than Pectobacterium and so generally causes a more aggressive form of the disease. Infected seed potatoes may come from infected fields or may become infected during processing. Both bacteria can live in tuber lenticels without causing disease. The bacteria become active when environmental conditions are right, and then disease occurs. Blackleg can occur at any time during the growing season, but it is favored cool, wet conditions at planting followed by warmer weather. Stand loss may result if seed pieces begin to decay before shoot emergence. In established plantings, the infection can move from tubers up the stems through the vascular tissues. When infected tissues break down, bacteria are released into the soil and travel in soil moisture to other plants. Pectobacterium and Dickeya do not survive more than a few months in soil; however, they may survive in crop debris, perennial weeds, or infected tubers allowed to overwinter and sprout the following spring. In aerial stem rot, the bacteria may be present in the field in weeds or on crop debris and enter plants through wounds or leaf scars. Bacteria may also be spread by insects or splashing water. The decay usually does not travel downward into the tubers. Development of aerial stem rot is favored by warm, wet weather. Dickeya and Pectobacterium may both be present in a single seed lot. Little is currently known about how the two species interact. 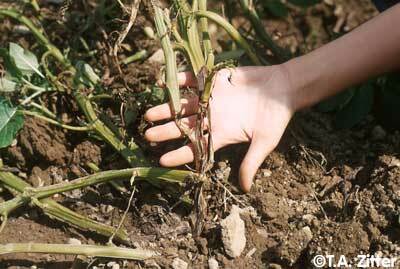 Planting: Remove volunteer potatoes from the field and keep fields clear of weeds. Plant clean seed: ask distributors for lots with Certified Seed Potato Health Certificates. When possible, use seed that does not have to be cut. Sanitize any machinery used to cut tubers. Plant well suberized seed pieces in well-drained soil at temperatures of at least 10°C. Do not irrigate before plants emerge. Avoid overhead irrigation if possible. Practices that reduce canopy density and leaf wetness duration can decrease incidence of aerial stem rot. Irrigation: Blackleg is associated with water. Both Dickeya and Pectobacterium are facultative anaerobes, which means that they thrive in the low oxygen environment of wet soils. Both bacteria may also be spread by water movement through the soil. Plant in well-drained soil. Both bacteria can also be found in surface waters (rivers, ponds) but not in deep wells. Avoid the use of surface waters for irrigation. Crop Rotation: Rotate away from potatoes for at least one season. Both Dickeya and Pectobacterium can affect a number of other vegetable crops, including carrots, parsnips, broccoli, corn, and sunflowers. Neither bacterium appears to affect legumes or small grains; therefore, these crops are good choices for rotation. Harvest and Storage: Harvest when vines are completely dead, as mature tubers are less susceptible to bruising. The spread of Dickeya is more significant at harvest, especially if tubers are handled roughly. Avoid injury at harvest. Harvest during dry weather. Remove as much soil as possible from tubers but do not wash them prior to storage. To promote wound healing, store tubers at 10-13°C and 95% humidity for up to two weeks. The temperature should then be decreased to less than 10°C. Ensure good ventilation and regulate humidity carefully to prevent condensation, but avoid dehydration of tubers.